What Are The Design Build Benefits? It’s the fastest growing and most popular method used to deliver construction projects. Design-Build companies differ from each other. Some have designers as staff, some subcontract architectural firm and/or interior design team to design the project. How is Design-Build set at Pionarch? Pionarch consists of two teams that work together or independently depending on the need and client’s comfort level with our company. Some clients like the idea of one team and some must do the design first to start trusting us. We do not force anyone to make that decision at the day one. We believe trust must be gained and we work hard to prove ourselves. Traditional Project Delivery is mostly used when the client wants to design the project to establish the budget. The Owner manages only one contract with a single point of responsibility. The designer and contractor work together from the beginning, as a team, providing unified project recommendations to fit the Owner’s schedule and budget. Changes are addressed by the entire team, leading to collaborative problem-solving and innovation, not excuses or blame-shifting. While single-source contracting is the fundamental difference between design-build and the old ways, equally important is the culture of collaboration inherent in design-build. The design-build process starts with a budget. Pionarch can adhere to the budgetary constrains if the client is willing to work with us on the scope and materials to stay within the budget. Once client’s start making changes, the budget may easily be altered. What is the advantages of design-build system ? All the team is together and all have the same goal to arrive at a successful project that meets or exceeds the client’s expectations. When challenges are encountered on a project (and there are always challenges), pointing fingers is not an option, everyone works on solutions. One entity is responsible for everything including how the end result looks, how much it costs and the timeline of the project. When the same group that designs the project also builds the project, there tends to be much more attention given to pricing and scheduling in the design phase. The cost of the project is taken into account early on in the process. Unfortunately, it’s normal for us to hear from people that “their remodel cost twice as much as the architect said it would”, while it’s less probability to fall into such problem in design- build. Design- build focuses on results, not excuses. A design-build firm is involved from start to finish, which adds a high efficiency and quality at work. Design-build firms are experts in both fields. The principals should be an architects with formal architectural training and experience in the architecture field. They should also have professional experience in construction and understand pricing, sequencing and how buildings go together. Design-build is transparent because we want clients to understand the process and to know what’s going on. The best partnerships work, not because people say what everyone wants to hear, but because they say what everyone needs to hear. Through clear communication the budget is defined early on and it becomes the agreement for the entire project. Design and construction involves managing hundreds of timelines that needed to manage the project. Design-build creates opportunities for clients to sit with big decisions, ask questions, and consider their options. Anything the team can do to avoid taking steps backwards is going to lead to better, faster and more cost-effective results. Big decisions can be revisited during construction without change orders or additional fees. Pionarch’s residential design fees in design-build process are based on construction cost budget. Our budgetary design fees tend to be around 6% before the fixed cost proposal is established. The budget in the first stages of design is established by square footage of the in-scope area times 250 dollars per square foot. 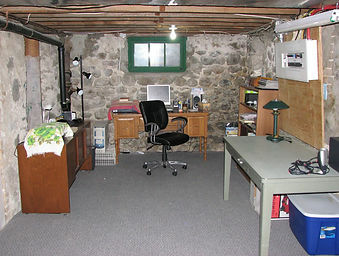 250 dollars per square foot is an average cost in Massachusetts. It is considered to be a medium quality products. Pionarch does not reduce construction quality based on budget. We are well known for high quality in medium price range for design and construction services in Massachusetts. When the budget cost proposal is accepted we charge 3% of the new construction budget to finish the design. We draw construction plans that are good for permit and approvals as well as construction. What is included in 6% design cost vs. 3% of left over cost? Due Diligence is an investigation on the property including the building condition to confirm all facts, such as site constrains (conservation land, FEMA regulations, zoning constraints, code constraints or updates) During this process we search for data and present your with a report of findings. In Schematic Design we measure the area in scope and draw existing conditions model. We meet with you to discuss space requirements and draw proposed layouts. We present them to you for approval. Sometimes we develop several options. In Design Development Pionarch looks for finishes and starts drawing details like millwork, kitchen layout etc. We produce set of specifications to be included in the fixed price proposal. We contact structural engineer (separate fee) and coordinate the structural engineer’s information within our drawing set. Permit set of drawings are drawings for the city/town to keep as records and tax purposes. The set includes schedules, code, details and everything a contractor needs to know to build the project. This is the set Pionarch takes to the building department before the start of construction. It takes few weeks for the jurisdiction to approve the drawings. Many times when the contractor has a question, the architect shows up to control the work progress and quality. In the design-build model the construction administration is minimal. When questions raise we come to the site for an hourly fee. A lot of projects do not require administration unless there is an unforeseen condition that raises. Design and construction shouldn’t be chaotic or stressful. A design-build firm is a beacon to clients throughout the process, guiding the way to the best possible outcome. Design-build refines a system from beginning to end and manages the chaos into orderly steps. Design-build operates under the assumption that the client actually wants to be an active participant in the design and construction of their home. By taking an involvement they’re guaranteeing that they get the outcome and satisfaction of their goals what they want is going to be achieved. We’ve found that such an involvement is inspiring and gives people a lasting sense of pride about their home. Working as a one group makes work more organized in many ways, and provides high quality results. Our estimates are based on detailed construction documents. We call them fixed price proposals. We use specification spreadsheets that are visible to the clients in google docs and include the line items from the spreadsheets. Pionarch charges 20% on top of material cost for ordering and coordination. It is common practice the contractor marks up the materials. We highly recommend we order the materials, as many times the delivery has to be scheduled around the construction progress. Some materials come damaged and we take care of the returns. At the end of the day it is less hassle to the client and the contractor. Why do we always specify the finishes at the last stage and in a rush? Aren’t the finishes just as important as the design and layout? Colors have very important rules in every space, whether it’s residential or commercial. They can be a tool to help in achieving the conceptual goals, but some architects tend to do without them until the last minute. Whether we’re working in the field or back in an undergraduate design studio, color is important and should play a bigger role in what we design. The color of a room has the ability to affect how you perceive the size of the room. Color also has the ability to influence the temperature of a room. You can change the mood and occupant behavior by changing the color themes. Using different colors or different patterns of color can even affect how the user circulates through the room as well as how quickly they move in the room. Colors and patterns are what create the character of a space. Any color will behave differently in relation with other colors and shapes. You can experience color in abnormal ways depending on which colors you place together and how you situate them. For example, in a yellow room, you may not notice any yellow objects. However, if you were suddenly in a red room instead, all those yellow objects would begin to stand out too much against the primary color. Choosing a color is very tricky. A color may cause a certain reaction in one person, but may evoke a very different reaction in someone else. This depends on many different things like someone’s personal preferences, what mood they’re in, how well their vision functions, and even cultural backgrounds. Warm Colors: To reflect passion, happiness, enthusiasm, and energy. Red: A powerful accent color. Power. Passion. Energetic. Elegant. Orange: Commands attention. Friendly and inviting, and less in-your-face. Cool Colors: Calming, relaxing, reserved, professionalism. Green: New beginning. Growth. Renewal. Energizing. Stable. Blue: Calmness. Responsibility. Peace. Spiritual. The shade determines whether the space will be calming or energizing. Purple: Royalty. Creativity. Imagination. Romance. Luxury. Black: Power. Elegance. Formality. Edgy. White: Purity. Cleanliness. Virtue. Simplicity. Gray: Conservative. Formal. Modern. Professional. Sophisticated. Brown: Warmth. Wholesome. Dependable. Reliable. Cream: Calming. Warm. Elegant. Sophisticated. Not all new homes are designed and built from scratch. One thing that sets this home apart from others is that it was designed and built on top of an existing foundation of a house that had burned down. While tragic, this fire gave an opportunity for a new, more modern, house to rise from its ashes. There are many things that make this house contemporary. The roof is flat and even wraps around the exterior to create an interesting space. It isn’t perfectly orthogonal and it has abnormally shaped overhangs. Even the siding breaks away from tradition, trading the usual clapboard for a modern panel system. One of the latest and greatest tools in the field of architecture is the 3D rendering. Renderings are able to provide an accurate representation of how your project will appear once finished. They give you a snapshot of the future and allow you to test different things such as finish materials in order to see how certain components will look with different styles. Windows and doors can be easily changed, and you can even model complex pieces such as the roof in order to create unique looks. By using rendering technology designers are able to provide multiple options for a design. This allows them to see what parts are working, which ones are not, and which ones should be modernized. For example, notice that the windows in this project are far from the traditional double hung windows seen on residences everywhere. A simple change such as that gives this house a more contemporary feel. An aspect of architecture that is always evolving is the materials. This project focused on creating a modern energy efficient home through the use of energy efficient materials. Modern materials applied to the exterior can help create even more energy efficient spaces, while materials applied to the interior in a unique way can give the inside of the space a contemporary feel while also adding to the efficiency. The combination of materials, the placement of windows, the wrapping of the roof around the edges of the house; These are all done in a way that creates an interesting, unique, and dynamic façade as well as a very efficient building envelope. The form of a house is not required to be simple. So why design that way? This roof is both functional and artistic. This project brings a whole new aesthetic to the neighborhood by changing the concept of what a roof needs to be. The contemporary home doesn’t have to just be contemporary on the outside. For example, the combination of different floor finishes in this project create a very unique space on the inside. The white walls are a solid neutral that allows almost everything to act as an accent, in the typical contemporary aesthetic. When it comes to renovating an existing house, style is always important. Do you keep with the original style of the home or do you change it entirely? Do you keep some parts the same? In this project we kept the bathroom layouts the same, while aiming to change everything else to a more contemporary design. The focus of this project was to make a home stand out in a conventional neighborhood where almost every house is a single story suburban home –to break away from uniformity. The shape of the roof on this project is unlike anything existing in that area. What makes a contemporary kitchen? Is it as simple as having an open floor plan? What about hanging decorative art on the wall? Can contemporary furniture make a contemporary space? Is having interesting materials enough? The answer to all these questions is that it takes many components to make a truly contemporary space. This kitchen for example, combines glossy, matte, and even some metallic materials to define its own aesthetic. The bold contrast of black and white coupled with the pristine straight edges of this kitchen separate the contemporary from the traditional. Long gone are the days where you work in an office for a few years and develop back problems for the next 50 years. There’s a new revolution in workplace productivity and comfort. Owners are beginning to take notice of how productive their offices are and how to increase those numbers. The key points to a productive office include incorporating ergonomics, having communication between employees, a focus on employee well-being, and creating a bright, clean atmosphere. Ergonomics is the study of people’s efficiency in the workplace. There is furniture, equipment, and materials. Height adjustable furniture, eye level equipment and soft materials contribute to good health and posture. Good posture consists of having your head upright and over your shoulders with your eyes looking slight downward without bending from the neck, having your elbows bent at 90 degrees with your shoulders and forearms relaxed, thighs should be horizontal with a 90-110 degree angle at the hip, and feet should be supported. Perhaps the most common issue with furniture in the workplace is the chair and back support. The backrest should support the natural curve of your lower back, without forcing it straight up. 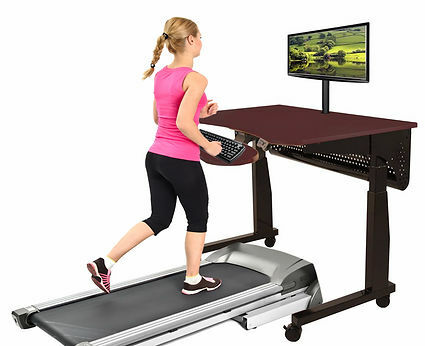 Another movement in furniture is one that allows the person to exercise while working. As reported by Forbes, this new system of performing work tasks is one that starts off with less performance, but then creates a more productive employee than one that sits in a traditional office. It is proven that 1.5 hours of moderate activity will increase life span by 4.2 years. Alan Hedge works through these issue in his presentation on Ergonomics and health. Ergonomics have been proven to reduce costs for employers. Blue Cross Blue Shield in Rhode Island invested in creating workstation changes, ergonomic programs and training, and standardized ergo equipment. This brought their Worker’s Compensation costs from $227,620 to $26,010, in just one year! Ergonomics can increase productivity in companies very drastically. Statefarm insurance decided to invest in new furniture and seating that was ergonomic and they reported that productivity has increased by 15 percent. Bad ergonomics leads to fatigued employees that don’t perform at their highest abilities. When an employee is tired or fatigued, they might not complete a task at company standards, but might cut corners to work less. Another key point to success and productivity in the workplace is communication between employees. We have all seen those offices where everyone sits in a cubicle, has their headphones in, and appears to be in another world. Employees that communicate more with each other, perform better and higher on their assigned tasks. Open communication between employees will also increase positive relationships in the office, which will increase productivity and activity. People like to work more when they are happy! 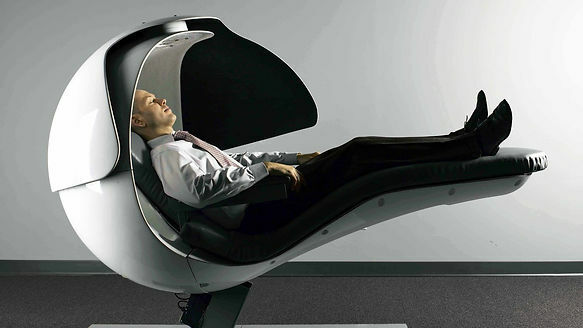 There are offices around the world working with a new type of system to help fix insomnia: the sleeping pods. The goal of the pods is to provide a quick “power nap” which increases productivity and the health of the employees. Some companies that have incorporated the sleeping pods include: Google, NASA, Facebook, Procter & Gamble, Nestle, Huffington Post, and Cisco. The last key point to a productive workspace is by providing a clean and bright office. We are moving towards a new way of working and living. In the past, work was physical labor, but now we are in the middle of a cubicle revolution that is taking the world by storm. 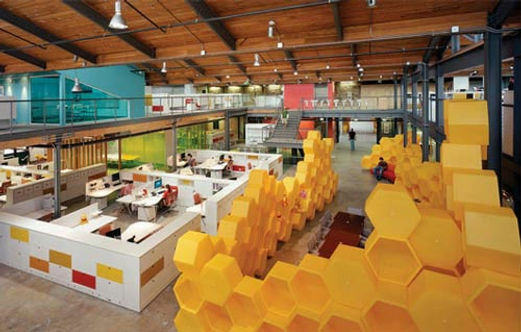 Through ergonomics, communication, focus on well-being, and an inviting office, employees are more productive. 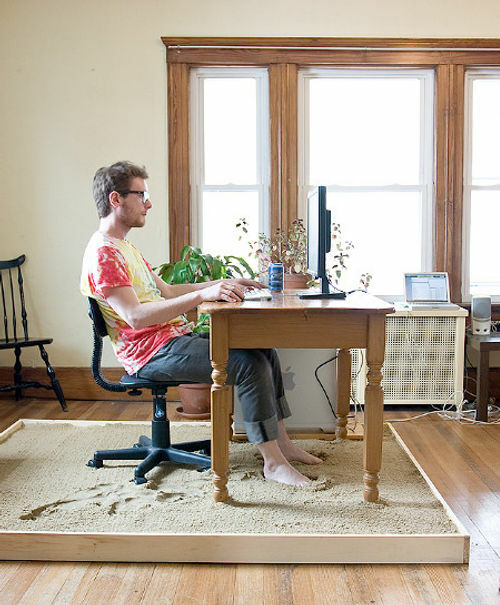 Although, we may never end our quest at the tranquil office and might go as far as moving our office to the beach. As children, we continuously play with building blocks, LEGOs, puzzles, and so on. Our mind is designed to take things and put them together. When these pieces are the same or modular, our creativity expands into another world of puzzle solving. The question arises of how would these pieces go together to create something, and that is the challenge that drives us. After we grow up, we tend to forget the building blocks that inspired and directed us towards the field we are in. At PionArch, we value and learn from things that are often misplaced and forgotten. The simple things can create a very dynamic and creatively interesting space. Sometimes something as simple as the outline of a square can be put together in an interesting way to create things like texture, dynamism, and define a space. We are currently working for a wonderful company that changes the lives of people with disabilities and autism spectrum disorders. NuPath Inc, is a non-profit organization that is located in Woburn, MA. It supports and helps people with disabilities achieve a sense of belonging within their community. We were asked create an access space into the back entry of the building as part of its back site design. The design went from a blank space to a dynamic design. The final product creates shade, insinuates pathway and direction, and brings a dynamic, textured look to a static space. The design is just one that shows that a simple square frame can be rotated slightly to create a very dynamic experience. The movement makes a texture that people can walk through, while playing with shadows and lights. Materials and shapes blend together seamlessly and in different scales. They can be applied to a small scale or 1’-0” x 1’-0” hexagons or squares put together with different thicknesses to create a texture on the wall. Singularly, each piece holds less creative and artistic value, until they are placed together in a composition. In this design, also for NuPath, Inc., we chose two different thicknesses and 4 different colors of acoustic panels and placed them together in a complete composition. The texture created a movement for the eye to follow, while providing acoustic relief. On a larger scale, modularity has been used throughout the world of architecture. Moshe Safdie took modularity directly to his building, Habitat 67. The simple idea of equality for all without compromising on green space bred Habitat 67. His design was so that every unit would be the same, but the arrangement of them was important as it created an outdoor space for each.